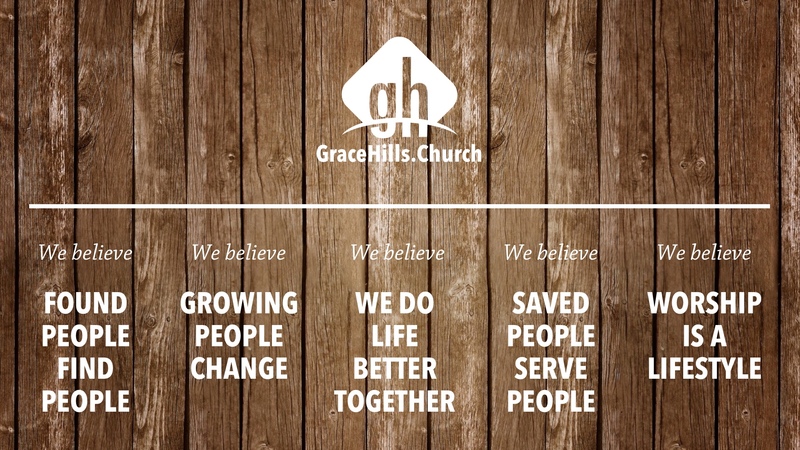 Grace Hills exists to help broken people know God, find freedom, discover their purpose, and make a difference for God’s glory! We help people know God primarily through our weekend worship experience. We help people find freedom by being part of a small group. We help people discover their purpose through what we call Growth Track. We help people make a difference by serving our community and our world together. We describe ourselves as a purpose driven church, which means we seek to live out God’s five big purposes for our lives together as a community: evangelism, fellowship, discipleship, ministry, and worship. We express those five purposes through five big statements. 1. Jesus first! We trust his Word, follow his lead, and honor him above all. This is our first core value because it provides the foundation and framework for everything else we do and believe. The Bible says in Colossians 1:18, “He is also the head of the church, which is his body. He is the beginning, the first to come back to life so that he would have first place in everything” (GW). We don’t claim to have all the answers about the Bible, but we believe it from cover-to-cover and trust that it is God’s perfect, infallible word to us. 2. We start small and think big. We go all in with a risk-taking faith. We want to do what God leads us to do whether it seems to make sense or not. This means giving big to the community and to global missions, and it means always considering our next step before it’s time to take it. 3. We are driven by purpose, not by programs, personalities, buildings, or budgets. We believe God gave his church five purposes to pursue: worship, evangelism, fellowship, discipleship, and ministry. Jesus echoed these in the Great Commandment (Matthew 22:37-39) and the Great Commission (Matthew 28:19-20). And a great commitment to the Great Commandment and the Great Commission will grow a great church! 4. We keep it real and fight against fake. We live and lead with authenticity. It’s exhausting to try to be religious enough for God. And it’s pointless to try to impress people. So we, including our Pastors and staff, are open about our faults and imperfections. We don’t have it all together. We don’t have it all figured out. And we haven’t yet arrived. We’re only as sick as our secrets. 5. We are broken people discovering healing together. We embrace messy ministry. We highly value counseling, coaching, and recovery ministry knowing in advance that it’s messy, requires time and involvement, and creates inconvenience. We love people who are hurting and want to do whatever we can to help. We’re a community of broken people finding healing in Jesus together. 6. Everybody belongs. We care about the heart, not the skin, the clothes, or the body art. We believe the church ought to be a home for people of every color, shape, personality, story, age, ethnicity, and socio-economic background. We ought to be able to befriend and do life with people who are unique and different than we are. 7. We keep it simple and stay fast, fluid, and flexible. We get creative to reach more people. We avoid adding programs and focus on living out our purposes instead. We try to stay un-busy and uncluttered. We provide clear “next steps” for every person to take. And we trust our Pastors to lead us forward without red tape, committees, and business meetings. We vote as a church on only a few things, like buying land or building buildings. 8. We discover our gifts and grow from consumers into contributors. We refuse to use people. When someone becomes part of the Grace Hills family, we’re careful to never ask what we can get from them but instead to ask what we can get for them. How can we help them discover their God-given SHAPE and serve his purposes in the most fulfilling way. 9. We grow larger and smaller at the same time. We gather together and scatter together. The earliest churches didn’t have buildngs. They met together in large groups on the weekends and then broke apart and met in each others’ homes throughout the week. We believe this is how people really get connected, stay in the loop, and grow – by attending the large weekend gathering and then being part of a small group with a handful of close friends. 10. We plant churches, partner with the community, and go to the ends of the earth. We’re way more concerned about the growth of God’s Kingdom than the success of our particular local church. So we multiply – as believers by sharing our faith story, as small groups to fill our community and make room for others, and as a church by planting more churches, campuses, and venues. We partner with community organizations rather than pioneering solutions for every problem ourselves. And we send missionaries all over the world.